Rome had made several attempts to conquer Britain before the reign of Claudius, but they were either abortive or half-hearted. Julius Caesar had landed with his troops twice in 55 and 54 B.C. At the head of a 'reconnaisance in force' operation designed to test the military strength of the local tribes. Augustus had planned to subdue Britain, but was forced to cancel the invasion due to greater priorities elsewhere. Notoriously, Caligula was said to have ordered the invasion of Britain, but, thwarted by the barrier represented by the English Channel, he ordered his soldiers to gather up seashells and carry them back to Rome as 'trophies' instead! However, it was under Caligula's uncle and successor, Claudius, that the Romans launched a serious and ultimately successful bid to conquer Britain. Ostensibly, the invasion was about defending a Roman Client king, Verica of the Atrebates, but the real aim of this conquest, as with so many other Roman Conquests, was chiefly about securing his popularity and thus, his hold on power by associating himself with a military success. Although Claudius visited Britain himself during the conquest, the actual invasion was lead by Aulus Plautius, a childhood friend of Claudius. Interestingly, the future Emperor Vespasian was also present during the initial invasion of Britain, in command of the Legio II Augusta, one of four legions of 10,000 men each which took part in the invasion. 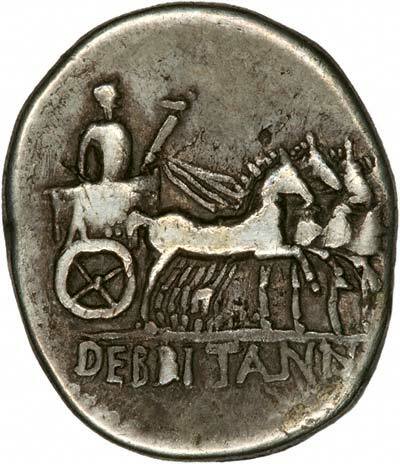 Despite the fact that Claudius did not participate in the actual invasion, this did not stop Claudius taking full credit for the achievement and had himself paraded through Rome in a triumphal quadriga (as depicted on the coin) and had his son awarded the title 'Britannicus'. 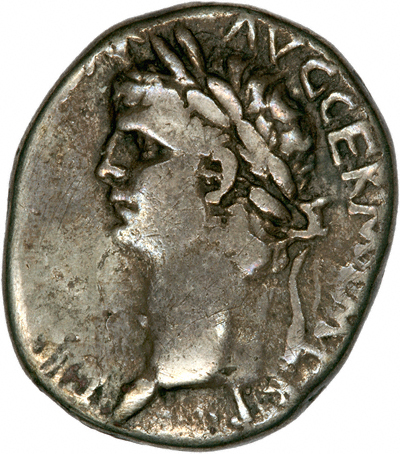 Claudius was obviously keen to propogate 'his' achievement in subduing Britain, and issued this coin, upon which his triumph is depicted, with the words 'debritannis' (for Britain). The coin is a didrachm (two drachm) coin minted in Cappadocia (in modern day Turkey) and intended for circulation in the eastern portion of the Empire. This speciman contains one of the very earliest references to Britain on a coin, and is therefore a very important piece for any collector of coinage relating to Britain. You may wish to visit our Roman Historical Notes. Although it is not complete, we add new and better coins when we can. We are always keen to buy superior quality Roman coins to upgrade our photo gallery. We also buy coins, please see our We Buy Coins page.